Mortar from Syria explodes near Druze village in the Golan Height. IDF returns fire. 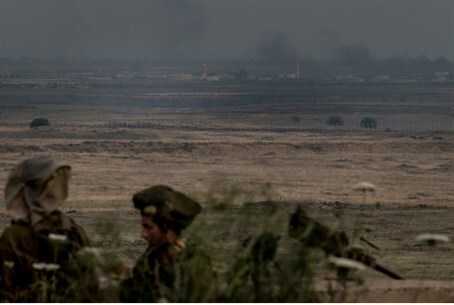 A mortar shell from Syria was fired on Sunday evening towards the Israeli side of the Golan Heights and exploded near the Druze village of Mas’ade. The mortar shell exploded in an open area, causing no physical injuries or damages. The IDF responded with artillery fire towards Syrian military posts, and the IDF Spokesman said direct hits were identified. The incident marks the third time in recent weeks that fire was opened towards Israel from the Syrian side of the Golan Heights. Late last month, an Israeli teenager was killed and several people were wounded after an explosive device was detonated near a passing vehicle along the border. Israel said that military forces loyal to the regime of Syrian President Bashar Al-Assad were behind the cross-border attack, and struck nine targets belonging to the Syrian army in retaliation. The United Nations Security Council later strongly condemned the intense fighting between Syrian government and opposition fighters in the Golan Heights and demanded an end to all military activity in the area. The resolution warned that ongoing military activities in the area of separation "have the potential to escalate tensions" between Israel and Syria, jeopardize the cease-fire between the two countries and pose a risk to civilians and UN personnel.